It appears Prime Minister Andrew Holness scored a shrewd political and security coup by unexpectedly declaring a state of limited public emergency in St. James. The wimpish PNP was brutally aroused from its hibernation and daily declaring the number of murders from a bull horn, the considered successful political and leadership strategy to winning the next due election. Creators of, and thus contributors to a significant portion of the Jamaican history, the PNP are cognisant of the power of the military to cauterise crime. Recount the effect, before it was prematurely ended, of the 2010 state of emergency in reducing murders in Jamaica. Other declared states of emergencies in Jamaica in 1966 and 1976 also reportedly resulted in reduction of criminal activity. Now Holness can unfurl this same maneuver elsewhere as needed to subdue the noxious, unbearable and unacceptably high murder rate. Lost in all this noise is the fact the promised police cars, dogs, surveillance airplane and other required resources to adequately equip the security forces are undelivered. And minster of national security Montague’s coming to his senses and renouncing his reported affection for obeah and the unnatural sciences, as well as an enlightenment vis-a-vis his role and interaction with the police commissioner. How can the newly aroused PNP leadership, now clearly out maneuvered by the JLP, and after a full three days retreat on national security, still be without a plan to significantly relieve Jamaica of this huge crime monster? The call by the PNP for “a special major investigation task force for high-crime areas” is much ado about nothing. All the other areas the PNP listed for attention including more officers, more resources, and dealing with corruption, are not new and uncover the shallowness of the proposed plans. The PNP had better ‘wheel and come again’. Jamaicans have disrobed and revealed their perpetuation of poverty and its attendant contribution to crime. Consider this, under the PNP the growth of the bulging PATH (Programme of Advancement Through Health and Education) was considered a most significant positive barometer of societal progress and success. The apparently sanctioned lottery scam, a reflection of complicity with corruption, and measure of moral and social decay, has mushroomed into a true crime tsunami, enveloping every nook and cranny of St. James. People live what they learn and know well, as a twig is bent so the tree is inclined. Disorder leads to more disorder and ever festering decay. How could Ninjaman, while charged with murder, be present at a function reportedly presided over and sanctioned by the minister of national security? The police who were present must have felt totally confused, demoralised, and demotivated. 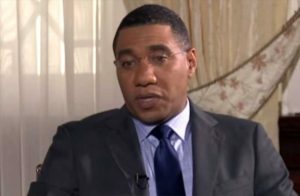 St. James and Jamaica at least for the next thirty days can enjoy some refreshing calm and a blast from the past, sleeping with windows and doors open – even though securely burglar barred in- as Andrew Holness unwisely, no doubt in a moment of political intoxication, had promised. And the PNP, obstinately refusing to be current and politically relevant, will no doubt, unfortunately for Jamaicans, relapse into permanent hibernation or a slow and excruciatingly painful self-inflicted death. The misguided and ruthless will likely disperse and attempt to continue their evil, murderous activities. Wisely the police have implemented curfews in likely hot spots to attenuate the expected crime flare. The government now has a short, narrow window of opportunity to implement long overdue sensible programmmes to sustain national security and the safety of all Jamaicans. The ZOSO (zones of special operations) should continue to facilitate a new socialisation including respect for law and order. In addition, the roll-out of the CCTV should be accelerated. Aggressive education around effective parenting must be made available to those in need. Attention to well thought out education including mandatory school attendance which will allow poor, young Jamaicans to become gainfully employed, or self-employed, must be aggressively pursued. The multiple churches in Jamaica and their congregants must have a renewing of their minds and willingness to live by the principles and virtues they extol. Dishonesty must be exposed and fully punished, whenever and wherever identified. Security force personnel must be principled, professional and honest in all interactions with every member of the society. Political leaders and their devout supporters can do the impossible, and like a leopard change their spot. Failure of the Holness government to urgently address and resolve these long standing, but demeaning, and progress limiting, ills will not be forgotten or forgiven. After all, states of emergencies are not meant to be indefinite. Jamaica this is your window of opportunity!